In This School, Class Is A Workshop And Experiments Are Mandatory : NPR Ed An innovative approach to learning amid turmoil in the Philadelphia School District. Haziz Self says that he's learned "what it means to live up to your principles." Imagine a school where classes are organized not by subject but by project — a school created not by administrators, but by teachers fed up with the status quo. A school where kids from a city's toughest neighborhoods are given the opportunity to experiment and the freedom to fail. In West Philadelphia, that school is a reality. It's called The Workshop School. The idea started with an innovative project for a few dozen kids at one of Philly's most troubled high schools, West Philadelphia High School. 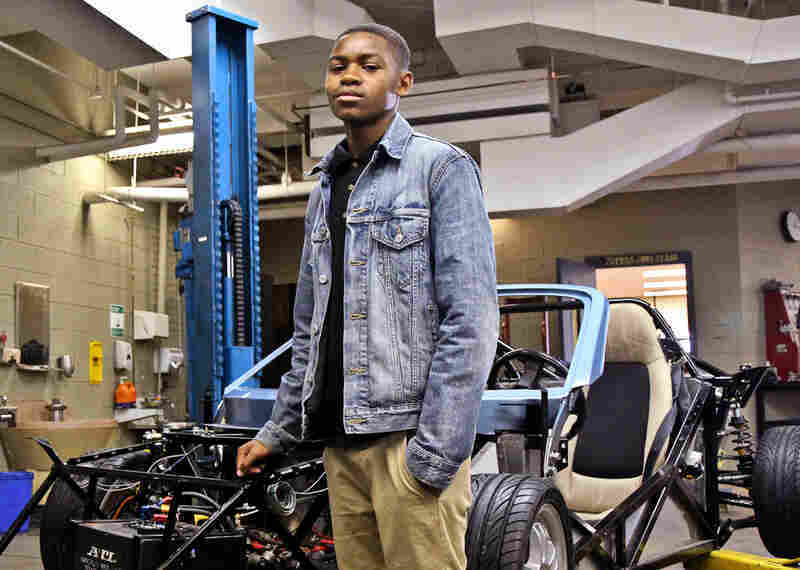 The project: building hybrid cars. In 2010, students there entered an international hybrid-building competition and survived the first round. The West Philly effort rivaled adult projects backed by major corporations and universities. That's when they got the attention of President Obama. "They didn't have a lot of money," Obama said of the West Philly High team. "They didn't have the best equipment. They certainly didn't have every advantage in life. But what they had was a program that challenged them to solve problems, work together, to learn and build and create. That's the kind of spirit and ingenuity that we have to foster." The Workshop School embodies several big trends in education that the Obama administration has supported, including a renewed focus on STEM subjects (science, technology, engineering and math) and career technical education. With the program's success, its founding teachers were able to raise private money and convince the cash-strapped School District of Philadelphia to let them think bigger. The Workshop School was the result. This year was the school's first as a full-fledged public high school. It hosted 90 students and will grow to 160 kids next year. Haziz Self just graduated from The Workshop School and says he loves its project-based learning. "Once you start something you've got to finish it," Self said. "That's a life lesson: Once you start something, you got to finish it." Project-based learning is characterized as "inquiry-based," meaning students start by generating their own questions. They then research and try to solve real-world problems and, either solo or in groups, present an outcome of some kind to an external audience. Projects tend to be interdisciplinary. In research dating back to the 1990s, this approach has been shown to improve student attitudes and performance, especially in math. But most public schools don't have the resources or ability to overhaul their schedules and apply a fully project-based curriculum the way The Workshop School has. That's a life lesson: once you start something, you got to finish it. Unlike traditional high schools, The Workshop School doesn't divide each of its class periods by subject. While students get traditional math and English instruction in the afternoon, mornings consist of two 90-minute project blocks in which students learn multiple skills at once. One of teacher Frankie Bonilla's lessons earlier this year turned a classroom closet into a recording studio. "It used to be a regular closet," Bonilla said. "And they gutted everything out, put up walls." The renovation alone allowed him to teach a broad spectrum of skills. "When we built the studio there was so much math involved," Bonilla said. "It wasn't scaffolded. It was kinda like, 'Put this wall up, this is how you do it.' They made a lot of mistakes. So it was a lot of English, some science and a lot of math." And the project didn't end there. Once the students had finished the renovation, they learned to compose and produce songs. The Workshop School hums with the hubbub of experimentation and collaboration. Here, a ninth-grader connects the wires on a miniature solar panel. There, another student develops a concept design to make Philadelphia's 52nd Street more pedestrian-friendly. And, on the ground floor, students work in three large automotive shops, designing and building hybrid cars. For Matthew Riggan, one of the school's founding teachers, what really sets The Workshop School apart is its insistence that kids need to have the freedom to learn from their mistakes. "We give our students a lot of freedom and responsibility to sort of organize and carry out the work," Riggan said. "There's less emphasis on telling everybody exactly what they have to do all the time, and more emphasis on them figuring out what that is, and understanding what it means to sort of live up to your goals and your values." Graduate Haziz Self says it's working. He's been amazed at the evolution he's seen in his classmates. Many are talking about college for the first time. "It's a big change, 'cause they want to go to [community college] when last year they just say, 'I'm going to just have a little job,' " Self said. "They want to do something with their life. Everybody wants to do something with their life now." He knows the change perhaps better than anyone. "Last year, was like, I wasn't even talking to nobody. I couldn't. I was too mad about a lot of stuff." Self's mother had been arrested and imprisoned, and he had to leave his home with her in New Jersey to live with his father in West Philadelphia. "I still send her cards. I still write her letters and everything. She's happy for me, 'cause, even though it was a big change for me, I was still able to stay on task, go to college like I said I was." In the fall, Self will move 130 miles east to Shippensburg University. And The Workshop School has a green light to expand to 500 students by 2018.